Sam Smith Park is just over a decade old. Over the years to come, as vegetation matures and habitat is allowed to flourish, more bird species will be attracted to the area to breed. They will join the ever-growing list of mammals reported in the park (beaver, muskrat, fox, coyote, deer, mink, rabbit, groundhog, opossum, raccoon, skunk, vole, field mouse). And, along with them, will come more birders, wildlife photographers, naturalists, students and nature lovers. The park is already a "destination attraction" for those who pursue this wildly growing interest. We've all seen their growing numbers in the park. Just imagine how important this feature of our precious park will become in the future if habitat stays protected, preserved and, hopefully, enhanced. When posting to the blog, I would appreciate it if folks would state their name. In the spirit of open communications. Some blogs do not even accept anonymous posts. I don’t think that we as a group are so intimidating… so no one should be leery of identifying themselves. Thought for the day: Anonymous posters are like the whimbrel, scarce, shy, elusive, fleeting and hard to spot. I think I missed them again! Don says try next year. There will finally be a public meeting about the proposed ice skating trail at Colonel Samuel Smith Park - June 5th, 7 - 9 p.m. at Father John Redmond School. The City will probably announce the meeting next week, but Friends of Sam Smith Park has joined CCFEW and New Toronto Good Neighbours to get the word out earlier (There is a link to CCFEW's website top left). Gary Wright: Chief Planner for the City of Toronto, Lindsay Dale-Harris, a partner in Bousfields, an urban design firm, Graeme Stewart, an architect with E.R.A. and manager of the Tower Renewal Project, Andalee Adamali of the Council of Agencies Serving South Asians. Moderated by Jane Farrow the Executive Director of Jane's Walk and the Centre for City Ecology and a former CBC broadcaster. Seventy five per cent of Toronto is made up of stable residential neighbourhoods and any new development has a huge impact on the people who live, play and work in the area. The city of Toronto, the province, developers, residents and BIAs all have a stake in the community but they don't always see eye to eye. These forums will explore how the planning process can be more responsive to residents who want to help determine how their neighbourhoods will change. We took to the road, holding meetings in North Toronto, Etobicoke, and Scarborough (upcoming May 24) to find out what the development and planning issues were, what people experienced in getting involved at the neighbourhood level and what they thought could be done to improve dealings with the city, their neighbours and developers. These local forums culminate in a city-wide event on May 29. Some of the hot issues are: inappropriate development, the OMB, secondary plans and avenue studies, park rejuvenation, community benefits, and social equity related to planning policy. All events are free * everyone welcome! The next meeting of the Lakeshore Planning Council will be hosted by members of the South Etobicoke Environmental Liaison Committee. Chris Winter, Executive Director of the Conservation Council of Ontario will speak about what the community can do to "Green" the Lakeshore. It should be an exciting session. So please join us on Thursday, June 12th at 7:30 p.m.at LAMP (185 Fifth Street). Everyone Welcome! The sports equipment storage boxes that were moved and regrettably placed right next to North Creek after shrubbery was removed to accommodate them are now being pushed down into the creek. This is not the right place for these boxes - habitat was removed, they are unsightly in a naturalized area and they provide an out-of-the-way natural gathering place that encourages this kind of activity. I wonder how long this heavy metal box will remain in the creek. Sign FOSS up for that Public Advisory Board! Wait a minute, what Public Advisory Board? Be careful where you or your dog walk on the grassy headlands. Sam Smith Park has a number of bird species that lay their eggs on the ground, in the grass, in well-camouflaged or sparse nests. The top photograph shows a Savannah Sparrow's nest and the second a Killdeer's. 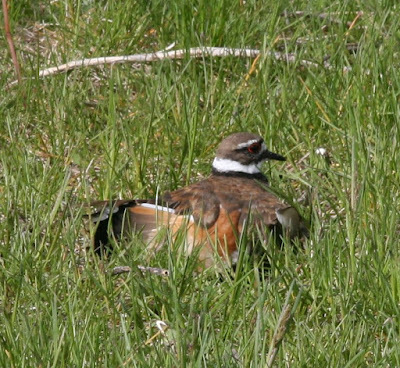 The bottom shows the parent Killdeer luring me away from its nest with the old broken-wing trick. Savannah Sparrows will remain on the nest until the very last second when you are just inches away. These photographs were taken this morning on the Eastern headland. The first whimbrels were seen today passing the eastern headlands in small groups of a dozen or so. They were very noisy. Watch for their long, downward curved bill. The bill shape will distinguish them from Dowitchers, another shorebird that is passing through at this time - their bills have a slight upward curve. You should be able to see them for the rest of the week. Check out the earlier post "THE WHIMBRELS ARE COMING!" There is a green plastic pipe emerging from the bank on the west side of the swale with rocks and gravel all around it. There are four conifers that are either dead or dying that obviously receive whatever flows from that pipe. Does anyone know what is causing this? Is it just rainwater runoff that is "drowning" the trees? Who should we contact? Someone has hand constructed a protective platform for a robin's nest that now holds five eggs. 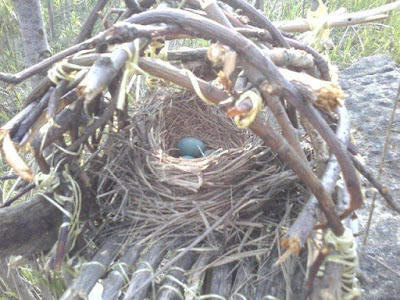 Robin's nests are often robbed of their eggs by predators. The mind boggles at the love this person must feel for the creatures of the park to spend so much time and patience to enhance their survival. This small, humble act speaks volumes about the passion people feel for their park and its wildlife. Friends of Sam Smith Park’s opposition to the construction of a skating trail north of the Power House proposed by Parks and Recreation boils down to two basic arguments - habitat degradation and the City’s continuing failure to create the long-promised Public Advisory Board that could provide consultation and review of design and development in the park and grounds prior to implementation. The photograph of the area where they plan to build it clearly shows the lush canopy provided by the deciduous and coniferous trees that grow there and are part of the continuing wildlife corridor that includes the southern meadow, the riparian pathway along North Creek, the spruce grove, the regrettably narrow, previously contested and sparsely treed gap between the quadrangle and the school and the orchard and wooded areas to the north. 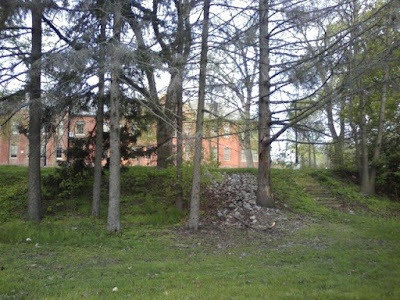 It is inconceivable to believe that a wide cement path in that spot with a foundation base containing freezing tubes and a surface area of 13,000 square feet would not require the removal of trees and cause major damage to remaining root systems. There would undoubtedly be habitat disturbance in other forms – additional lighting, music, noise from the zamboni and compressor pumps, additional activity and the probability of noisy skateboard use during the other three seasons (school maintenance staff are already finding homemade plywood ramps hidden among the trees for use in font of the school. The second photograph at the bottom of this post shows destruction already of the habitat north of the Power House in the form of understory removal. The shrubs and ground plants that used to be there and provided cover and feeding spots for wildlife, particularly birds, have all been picked clean. It is not hard to imagine what might happen to the remaining understory if the plan goes ahead. Friends of Sam Smith’s second argument is that there exists no formal forum for the public and community groups to plan development together with City staff. The park and grounds are a special, unique place with passionate appeal for many stakeholders. This was clearly understood by the public, City planners and local Councillors who put together the Master Plan in 1996 and echoed by Councillor De Baeremaeker in his 2006 report A Place for Nature, a Place for Youth, as well as the hundreds of park users and local residents who stood up to oppose the skateboard facility back in 2006. The Master Plan for the Lakeshore Grounds, approved by Council, recommended “a specific group be appointed by City Council to provide input to the Design and Management Committee. Members should represent the wide variety of interests (the arts, boaters, naturalists, heritage, social workers etc.)”. Councillor Glen De Baeremaeker’s report that addressed public concern over the construction of a large skateboarding facility south of the Power House and eventually killed the plan recommended that Councillor Grimes “fulfill the former City of Etobicokes’s original 1996 promise to create a citizen’s advisory board to help protect and restore Colonel Sam Smith Park to its full ecological potential”. Friends of Sam Smith Park and other groups have persistently demanded that our Councillor fulfill this obligation and set up this board. Until these promises are carried out and genuine input is valued, community groups and the public will continue to feel that they are constantly put on the defensive and kept away from real decision making rather than being appreciated as important contributors to the Park’s future and purpose. We are taxpayers and the park and grounds belong to the people of our city. So a simple slogan that might capture both major arguments could be …… No more development in the park without the approval of a Public Advisory Board, particularly if it applies to habitat areas. Some other points that have been put forward by members of F.O.S.S. and by others in the community who oppose the skating trail are listed below. They might also be weighed alongside the two central arguments that constitute Friends of Sam Smith Park’s position. There are other maintenance and enhancement projects in the park that need attention (the skating trail would divert two million dollars away from the Parks and Recreation budget!) For example, the photograph here shows what was left after the large observation deck that overlooked a bird hotspot was burnt down by vandals a few years ago. The funds have not appeared yet to replace it. Other needs: more picnic benches, interpretive signage, open washrooms, removal of rebar, enhancement of play equipment south of Jean Tweed, replanting of previously removed shrubbery, dredging and rehabilitation of North Creek etc.). Maybe its better to maintain and enhance what we already have before embarking on controversial new projects in a time of budget crisis. The trail could become a very expensive 12-week white elephant. It is well away from the main street, isolated, hard to get to and away from stores and restaurants. The City would find it difficult to maintain and operate the facility properly. Remember, the City had to be bailed out last winter by a private company in order to keep its existing rinks open. Vandalism and the danger of misuse of the proposed firepit in a park known already for its incidents of arson would be a threat without the passive surveillance of a more accessible site. The idea of the skating trail becoming a walking trail out of season makes little sense. There is a track adjacent to Father John Redmond virtually unused by the public and, anyway, people prefer to walk by the lake out along the headlands. The trees that would be removed or probably damaged are heritage remnants of the former Psychiatric Hospital’s tree nursery (hence the straight rows). Enhanced, rather than diminished habitat, is a huge drawing card for park visitors. If a concession counter in the Power House was part of the plan, its very existence might be the thin edge of the wedge, inviting even more active recreation, expansion and facilities in that area. Friends of Sam Smith Park and many others have another vision for the Power House. De Baeremaeker, in his report, picked up on our idea that the Power House become a Nature Interpretation Center. He recommended that there be “created a young naturalists’ program (based out of the Power House) to introduce urban youth to the miracles of nature hidden throughout Sam Smith Park”. See the blog post WE NEED A VISION FOR THE POWER HOUSE from May 2008 for more information about this. People simply like the park, especially where the naturalized areas are, the way it is! They do not want any more cement in their park. Have you seen any of the following birds in the park, particularly in the area adjacent to the Power House? Acadian Flycatcher, Henslow's Sparrow, Kirtland's Warbler, Olive-sided Flycatcher, Common Nighthawk, Canada Warbler (pictured above), Golden-winged Warbler, Hooded Warbler, Yellow-breasted Chat, Cerulean Warbler, Louisiana Waterthrush. 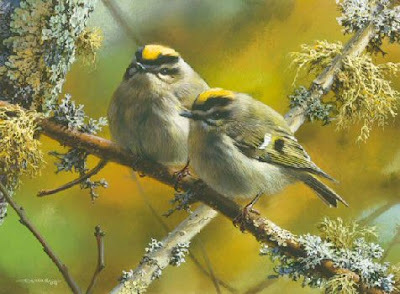 These birds are listed on the Canadian Government's Endangered Wildlife list as "endangered, threatened or of concern". In our efforts to have Sam Smith Park seen as an important habitat and refuge for birds in decline, it is important that we record sightings. Please pass this request around to your birder friends and call Terry Smith at 416 251 5930 if you hear of sightings. Thankyou. Question: What is missing from natural eco-system to control cormorants? Connie suggested contacting Ralph Toninger. It was asked if we can put up signs saying this is a Natural Habitat Area – it is supposed to be here. Barbara Keaveney said she would check the wording of the signs in Mississauga. In Mimico Linear Park there will be a dune feature that will be a mirren grass and cotton wood restoration dune. People are concerned because they are not seeing as many frogs and toads. Discussion about the skating trail and negative environmental impact on the park and wildlife. Set-up meeting for executive to review issue. Question was raised – Can we ask for a full environmental assessment around the introduction of the skating trail. Do you know about the bird featured in our new FOSS logo, the whimbrel? It is a large brownish shorebird with its most striking feature being its long down-curved bill. Every spring thousands of these birds pass by and over Sam Smith Park, on their way from their wintering grounds along the Atlantic coast to their northern breeding grounds, the wetlands along the arctic coast of Hudson Bay. They pass by in groups of 35 to 150 individuals and are very vocal, trilling constantly. Typically, you hear their call before you actually see them. If you are lucky, a group might actually land to rest for a few minutes on the rocky headlands. As many as 2,000 can be seen from our park in one day. They arrive as if by clockwork, every year the same – May 19th to May 24th. Unfortunately, this is a threatened species, due mostly to declining habitat. The Hudson Bay population has declined from 42,500 in 1973 to only 17,000 today. Watch for “whimbrel watchers” every morning and most of the day during their migration. You’ll probably see Dave Hallet and Wayne Renaud, local Sam Smith birders, and many others out there on the east headland with their telescopes, binoculars and counting charts. This is part of a larger organized whimbrel watch carried out all along the northern shore of Lakes Ontario and Erie. The whimbrel is just one of many species that is making Sam Smith Park and its unique habitat a birding hotspot in southern Ontario. Probably the most important thing that happened at the AGM last night was the adoption of a resolution covering FOSS’s stand on the proposed skating trail. 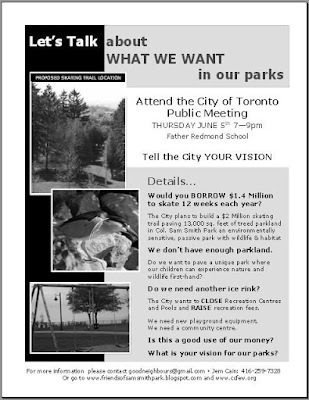 Members overwhelmingly voted to oppose the plan that will be put forward on June 5th at a public meeting at Father John Redmond by Toronto Parks and Recreation. Reasons range from ecological to financial and will be further developed in a later post. Instead, Friends of Sam Smith Park will propose the preservation and enhancement of our precious remaining green space based on the principles outlined in a previous post today. FOSS will work along side other community groups who also oppose this proposal. Our guest at the AGM was Connie Pinto from Toronto Region Conservation Authority. The TRCA was responsible for the construction of the park back in the 80’s and 90’s, a remarkable example of lakefill construction on the shoreline, and for the habitat creation projects that make the park such a magnet for wildlife. She talked about the wildlife seen in the park (Have you seen the mink yet?) and answered many questions. We were treated to a history of Colonel Samuel Smith Park and the Lakeshore Grounds from the colonel’s land holdings in the late 1700’s, through the “Lunatic Asylum” years (1880 to 1979), the handing over of the property to the City of Toronto, to the writing of the Design and Implementation Plan for the park and grounds in 1996 that set goals and principles for park governance before the park became the responsibility of Toronto Parks. When you look at the Goal Statement in that plan, you can clearly see where Friends of Sam Smith Park gets it direction and energy. We share exactly the same aspirations for the park. “To conserve the heritage features and restore ecological integrity to the site while providing one accessible distinctive place that is conducive to the public’s education, recreation and restoration”. That last word, “restoration”, refers to the therapeutic heritage of the site, a place for quiet healing. The plan states that “passive recreation should dominate at this location” and Friends of Sam Smith Park, right from our conception two years ago, when we fought the City over its plan to build a large, regional skateboard facility next to fragile naturalized areas, has worked to maintain that principle, working against more cement in the park and “active” recreation projects. The deputation that was made by Friend of Sam Smith Park in August 2006 to explain our reasons for opposing the skateboard facility is archived here if you are interested in reading it. Friends of Sam Smith are many and we have a supporter distribution list of nearly five hundred. All of us have family, friends and neighbors, so we are in fact more than that. Friends of Sam Smith are local residents and park users who have enjoyed the quiet, the solitude and natural beauty of our park for years and who want it left undisturbed to mature into its full potential. We walk, jog, bike, fish, bird, photograph, sketch, watch wildlife, daydream, do tai chi, think, picnic, read, write poetry, introduce our children to nature, sunbathe, and snooze in the park. Passive, therapeutic, recreational use of the park as was intended in the original plan. Friends of Sam Smith are families who care for the Lakeshore community, especially the Lakeshore waterfront. We get in the mud on park clean up days and lovingly remove the litter, the bottles and the rusted shopping carts. We are emotionally attached to the park in a deep way. We are in awe of its breathtaking beauty and get busy and heated when our sacred place is threatened. We are folks who, when most of us belatedly and unexpectedly find out that a half million dollar, huge, regional skateboard facility might be plopped right next to our beloved woods, wetlands and creeks, respond with bewilderment and anger that such an obvious lack of fit would even be considered. Many of us have seen large skateboard facilities on our travels and, while marveling at the goings-on, know they are never ever, never ever built in places like this. We cannot for the life of us understand why fifteen hundred square meters of concrete, with its urban/industrial, high decibel, high-energy, high intensity activity might end up here! Friends of Sam Smith worry that, because of the noise, the clattering and the banging from a well used district skatepark, the wild things that make our park their home will have to move over yet again …. and to where? as green space ever diminishes, replaced by cement. We anxiously wait for spring to see if our swans will raise a brood again and marvel that southern egrets and mocking birds are tentatively making a foothold in our northern sanctuary. We eagerly anticipate the magic of the incoming and outgoing migratory invasion of woodland warblers along North Creek, many threatened because of habitat loss. They are like jewels in the trees and shrubs, trees and shrubs that are literally just meters away from the proposed skateboard site, the same spot where monarch butterflies gather in large numbers on the spruce boughs before their flight south over the lake. We watch the evening activity of the beavers in the wetland pond and some of us have even surprised a deer in the woods. We fear the impact such a facility would have on all of this wonder. We are citizens of Toronto who have more than just a limited Coney Island and condo vision of our precious waterfront, who recognize the enormous value that local, natural sanctuaries offer to frazzled city dwellers. We worry that this could be the thin edge of the wedge. Coveted concession stand privileges next to the proposed skatepark are already being lusted after. What next? A bar, amusement park, music, more bars and restaurants! Friends of Sam Smith are residents, constituents, voters, community supporters and users of local business who understand that “revitalizing the Lakeshore” comes in many colors and is not just limited to business opportunities. We are a community that sees the changing face and future of the Lakeshore, that sees all the young professional families moving into this area, the creative talent pool that this community and this city needs, according to our Mayor. These families say over and over again that they are here because of what our peaceful waterfront oasis adds to their lifestyle. Imagine the future, a Greater Toronto, an urban sprawl that stretches from St. Catherine’s to Pickering to Barrie without the relief of accessible, peaceful green space by the water to recharge our batteries. Friends of Sam Smith includes Dan Brookes, a 16 year resident of the area, a Professor of Ecology and Evolutionary Biology at the University of Toronto and a member of the National Academy of Science, whose professional opinion is that the environmental assessment done by the Parks Board is seriously deficient and does not even satisfy its own terms of reference with regard to buffer zones like the meadow south of the Power House, the proposed site. According to Dan, the destruction of buffer zones can set back the development of a self-sustaining wetland area substantially. You’ve all got to pick up the brochure with Dan’s wonderful explanation of the park’s evolutionary journey, where he likens the park’s ecosystem in present time to a fragile child, full of life and energy and possibilities for the future. We wonder why this man’s impeccable expertise was never sought. Friends of Sam Smith also includes teachers imaginative enough to wonder why the Power House cannot be used by both school boards as an outdoor education center – so many of these opportunities have been lost to our children in recent years. I used to bring my special ed students here every spring on a nature ramble, troubled kids from Regent Park. I would watch their hard faces melt as they held a garter snake in their hand or hear their excited wows as a hidden heron took wing right beside them. We have read and can relate to professional journals describing something called Nature Deficit Disorder, a condition increasingly seen in aggressive, stressed-out, anxious city kids who have lost their connection to the natural world, harmed in body and soul by our culture's sterile rejection of nature. We worry about that. We feel bad for local skateboarders who have been presented with a concept design that is timid, watered down and not what they want nor what they were promised. Money that should have been set aside for bowls, rails, steps and ramps has instead gone to landscaping so that this ill-advised project will supposedly fit into its badly chosen surroundings. No one, skateboarders or nature lovers, ends up being even remotely satisfied with this. We believe that serious skateboarders have their own distinct, decent culture, one that is civil and desires to operate in harmony with the community. Friends of Sam Smith are not people who are willing to passively accept a process that has been flawed from the beginning because of its lack of transparency and proper public consultation, its unnecessary rush, it’s limited scope in imagining other more appropriate locations, the inconsistent science in the biologist’s report and the outdated criteria used for the site selection. Not to mention the fact that the opinion is widely held amongst us that this site had been chosen long before the only public meeting, long before City staff came up with their faulty postscripted paperwork to support it. We have become mistrustful. We are not impressed by the site evaluation used by City staff to assess various locations for the skateboard facility. We are surprised, with so much emphasis on the environment these days, that the same weighting was actually given to things like storage and parking as was given to impact on natural areas. And even when these suspect evaluation criteria were tallied, Sam Smith only squeaked slightly ahead of its closest competitor by a small margin. We are astounded that the enormous up swell of public opinion from residents against Sam Smith as the site would not more than make up for this, especially considering that the City’s Parks staff stated in the site selection report, and I quote, “scores need to be considered with public input and other information”. Well, they’ve certainly received our input now! Friends of Sam Smith are not happy at the lack of vision shown here. With its exclusive emphasis, come hell or high water, on this one extremely controversial and inappropriate site, more imaginative solutions may have been ruled out, solutions that could have made everyone happy and not ended up creating winners and losers in our community. Time and opportunity have been lost. We are puzzled as to why our councilor changed his mind. The Etobicoke Guardian quoted councilor candidate Mark Grimes as stating at an all-candidates’ meeting during the 2003 municipal campaign that he “would advocate putting a skateboard park on the vacant industrial lands in our community”. We do not understand why a commonly accepted, levelheaded and realistic idea like that has morphed into one that nobody can make sense of, one that makes the skeptical ones amongst us think that we might not have been given the whole picture. We are not people who have a short memory. We are not forgetful of the excitement generated in our community when this park was first established, this jewel that we thought would be the City and ours forever. We are baffled and angry that so much of our tax money, many millions in fact, was spent by the Conservation Authority to naturalize what started out as nothing more than building-site lake fill. Over the years we watched the trucks bringing out debris and we marveled at the miraculous regeneration and naturalization that followed. We feel strongly that this misguided proposal will put our wisely spent financial outlay in jeopardy, that it will waste what we have already invested at great cost. We are not impressed by City Council’s decision to keep their hands off this matter, a matter that involves Toronto’s Green Plan and our city’s waterfront as a whole. Something like this should not have been left to only a local councilor, a junior councilor in his first term, to relentlessly force a pet project through against widespread opposition, like the ward bosses of old. We are not sure why our so-called green mayor remained silent and never stepped in. We are not filled with enthusiasm at what appears to be the growing demise of local democracy at City Hall with its unwieldy, rubberstamping council and its reluctance to embrace reasoned, intelligent input from on-site community groups. Neighborhood activist groups all over the city complain about this same problem. We are not in any way assured that the currently proposed location, tucked out of the way in isolated wooded parkland, without supervision, lights or telephone, watched over only by occasional users of the park access road and the rare passes by overworked local police looking after a high crime area like ours would even come close to providing the safety and guardianship, passive and direct, that we want our children and youth to have. We have all seen the uncontrolled vandalism already present in the park, the burnt-out wildlife viewing platform, the destroyed interpretative signs, the graffiti and tags, the broken beer bottles, the litter, the Power House washrooms perpetually closed because of vandalism – we cannot see any of that getting better if this goes through. Friends of Sam Smith are not NIMBY’s. We want that first class facility built in our front yard, in an open, visible area, where these things are always built, no matter in whatever jurisdiction you wish to look. For example, the comparable skateboard facility they are building near Asbridges Bay is on open land right at the intersection of two busy main roads, Lakeshore Blvd. East and Coxwell. Incidentally, that project went through a proper public consultation. It was comprehensive and unrushed; it considered and valued public input, did not rely on the petition game and, guess what was the result – widespread community and skateboarder approval. And lastly, we are not happy about what has been poor and time-delaying dialogue between the local skateboarding community and the planners. We feel bad that the skateboarders may have to wait even longer for what they were promised. So, because of who we are and because of what we are not, Friends of Sam Smith emphatically says no to there being a regional skateboard facility at the proposed location in Sam Smith Park and urge the Selection Committee to proceed as fast as it can to get the promised facility built without delay in a location and with a design that meets the needs of everyone in our community. At yesterday’s Annual General meeting, members were asked to do some “visioning” for the park. It often seems that Friends of Sam Smith Park is in conflict with the powers that be over some ecological issue or other. It is right to defend, but it is also important to be a proponent of new ideas. Here are some of the thoughts that were put forward …. If you have any suggestions to add to our growing list, send them on to friendsofsamsmith@gmail.com or add a comment below. These ideas can be made real if we work at it. There will be an Open House meeting on the skating trail. It will be held at Father Redmond School. (this will be to include the students - there may be a break in the hours). Many of us enjoy walking in Sam Smith Park with our dogs and it is a fact that city dogs are not exercised enough for their physical well being. Indeed, in Turin Italy, as of2005, a city bylaw was enacted stating that owners will be fined up to $750 if they do not walk their flogs three times a day. In addition as pack animals, city dogs do not have enough opportunities to socialize with other members of their species, which is necessary for their psychological health. Our park offers this opportunity, which many people take while supervising the canine interactions. Now that spring is here the ducks, geese, swans, and some additional birds are nesting on the ground in Sam Smith Park. Eggs are laid and incubated, in many cases near the water's edge. They are wild creatures without access to veterinarian care should they be injured in any way. On a daily basis although Sam Smith Park does not have a designated leash free zone dogs are off-leash walking beside their human companions, socializing with other canines and in some cases running about unsupervised and out of sight. It is the third category that is of concern during nesting season. Do you know where your dog is at all times? Is your dog harassing or harming wild life? In addition, should your dog behave in a way which threatens signets, swans can take quite aggressive defensive actions and Canada geese also are known to defend their goslings. Sadly, throughout the world birds generally are under heavy threat of endangerment if not extinction. 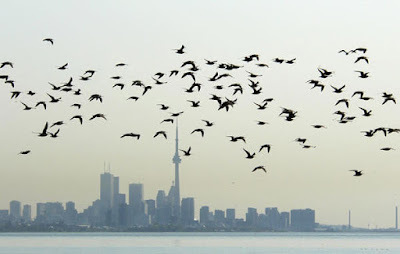 The reasons for this include destruction of wetlands and forests, mono-crop cultivation, pesticides, oil spills, diseases (such as avian flues and West Nile), and tall brightly lit buildings along their migratory paths (such as in downtown Toronto as documented by FLAP). Furthermore, a 2003 study in Holland indicated that in noisy urban environments some songbirds cannot shift the pitch of their songs enough to attract mates and the noise can prevent their young from even hearing and learning their mating songs. Of particular ethical interest quite outside the supervision issue is a 2007 Australian study that showed that walking dogs in natural areas dramatically reduced the number and variety of bird life. "Dog walking and conservation areas really don't mix," according to ecologist Peter Banks, a specialist in prey and predator behaviours. To not be one sided it must be acknowledged by this feline lover that predation by house cats especially in North American where indigenous birds have not evolved defense mechanisms to non-indigenous cats is a terrible threat to bird populations. This ethical dilemma is whether to let kitty outside at all. At the very least, it is recommended that cats should be inside at dusk and dawn when the birds are most vulnerable. As to dogs, it is suggested that if your pet is leash free and not by your side, he or she does not go into the naturalized part of the park during nesting season. Indeed a responsible person who cares about all animals and their well being (and who understands that there are some people who are afraid of dogs) should always have their dog in sight and under their direct control. It is the presence of the birds that make Sam Smith Park a beautiful and peaceful place for us all, especially the many visitors who are active bird watchers. Let's think about the ancestors of our doggy friends, the wolves and how they co-operate for the benefit of the pack. FANCY AN AROMATIC EVENING OF AROMATHERAPY IN THE PARK? Join CCFEW (Citizens Concerned for the Future of the Etobicoke Waterfront) for what I am sure will be an interesting evening. There is a link to CCFEW's website at the top of this blog. Garlic mustard is one of the few non-native herbs capable of invading and dominating forest understory communities. Its tolerance of low light levels, coupled with its high seed production and ability to spread rapidly, make garlic mustard a strong competitor. It diverts resources from native spring woodland plants. Because it begins growing very early in the spring, garlic mustard has a head start on other flowering plants and tree seedlings. Native woodland flowers are in danger of being crowded out by garlic mustard. It readily invades forested habitats where it can displace native plants, compete with timber species regeneration, alter soil composition and structure, impact natural associations between plants and fungi, and result in cascading ecosystem impacts. There will always be pressure from the City to set up conventional, recreational programming with the usual add-ons in and around the expensively renovated Power House as long as it remains, in their eyes, under utilized. We need an innovative vision for this area that is an appropriate fit with the natural features of the park that we all cherish so much. This is a letter that a committee of Friends of Sam Smith Park has been working on and will send to the Minister of Education, our M.P.P, the Boards of Education and others. What do you think about this idea? 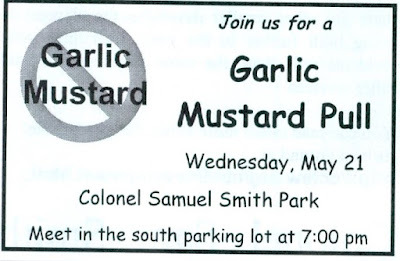 Friends of Sam Smith Park (FOSS), is a community-based organization. Our mandate is to protect, enhance and preserve the Lakeshore Grounds in South Etobicoke and to facilitate education programs that foster an appreciation and preservation of the park. This site is a perfect place for nature study by school groups from the TDSB and the TCDSB in Toronto. Therefore, we recommend its use for outdoor education as a showplace for the process of habitat construction and ecosystem studies. Indeed two public documents suggest that the Power House be used as a support building and we would like support in establishing this. 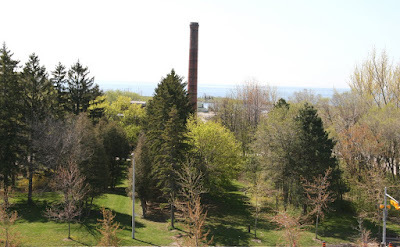 "The Lakeshore Grounds Master Design and Implementation Plan of 1996", states that "a second activity centre is proposed at the former Power House. It is recommended that this building be refurbished to support park activities and that facilities should include an interpretive/information centre". Councillor Glen De Baermaeker's Report, "A Place for Nature, a Place for Youth: A Report on the Skateboard Park Proposal for Etobicoke's Colonel Sam Smith Park" of September 2006 advises that the Power House "be a base to create a young naturalists' program to introduce urban youth to the miracles of nature hidden throughout Sam Smith Park". The Sam Smith Wetland Creation Project is a park that was established by a number of government agencies (and a trust) including the former MTRCA. It was created using the MTRCA Remedial Action Plan based on rubble disposal, leading to a detailed naturalization of the site. This is the first planned project of its kind in an urban area of the Great Lakes Region, and along with environmental benefits, the site might well be the first introduction for many students to Lake Ontario. This site includes spawning and refuge areas for fish, amphibian ponds, junvenile, foraging and hibernating habitat for herptiles, mammal habitats, and foraging, nesting and loafing areas for birds based on shrub, meadow and aquatic vegetation communities. Most of the animal communities have located themselves in this complex ecosystem. Kathleen Wynn, the Minister of Education for Ontario, has promised that all 32 recommendations of a working group she commissioned on Environmental Education, which reported in June 2007, would be implemented in all grades "as a priority". The report stresses that students should receive systems training in how interlinking parts of ecosystems function. 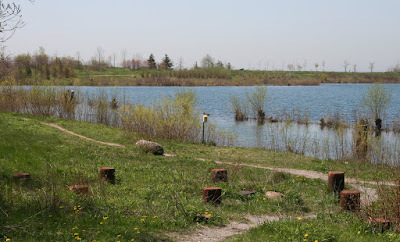 FOSS is suggesting that the Power House, which is maintained by Toronto Parks and Recreation and is not being used for weekday programs, could provide teaching space and toilet facilities to the TDSB and to the TCDSB, in conjunction with direct observations in the wetlands the park for educational purposes. Costs for staffing by the TRCA or other appropriately trained personnel and for general maintenance by Toronto Parks and Recreation could be covered by student fees, with school subsidies as required for individual students, as is common with ongoing field trips. This could be an opportunity for cooperation between public sectors. Another advantage is that transportation to Sam Smith Park would be economical as the site is very accessible by several choices of public transit. We are soliciting your feedback and your support in regards to this timely environmental proposal, especially given the closure of some outdoor education centres by the previous provincial government.